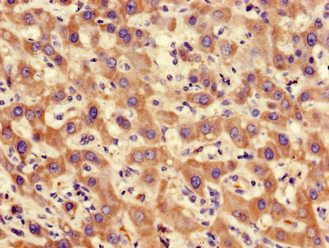 Immunohistochemistry of paraffin-embedded human liver cancer using PPP2CA Polyclonal Antibody at dilution of 1:100. Immunofluorescent analysis of Hela cells using PPP2CA Polyclonal Antibody at a dilution of 1:100 and Alexa Fluor 488-congugated AffiniPure Goat Anti-Rabbit IgG (H+L). PP2A is the major phosphatase for microtubule-associated proteins (MAPs). PP2A can modulate the activity of phosphorylase B kinase casein kinase 2, mitogen-stimulated S6 kinase, and MAP-2 kinase. Cooperates with SGOL2 to protect centromeric cohesin from separase-mediated cleavage in oocytes specifically during meiosis I. 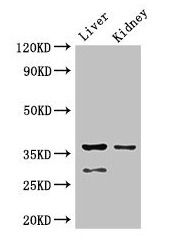 Can dephosphorylate SV40 large T antigen and p53/TP53. Activates RAF1 by dephosphorylating it at 'Ser-259'. 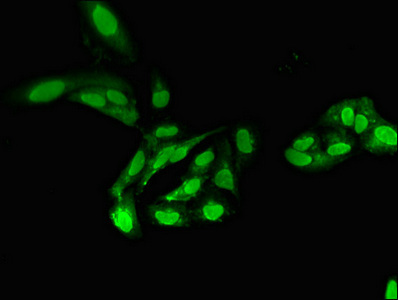 PPP2CA Polyclonal Antibody. Unconjugated. Raised in: Rabbit.